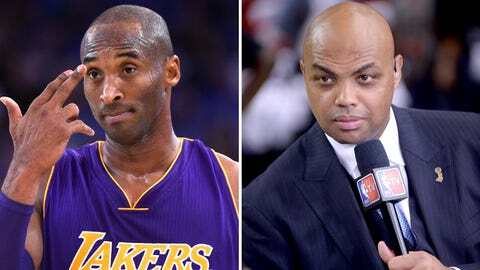 Sir Charles (right) thinks Kobe needs to call it a career after this season. Is he off base? Scroll to bottom to comment. It’s going to be a topic until the end of next season at the earliest. Will 2015-16 be Kobe Bryant’s last in a Los Angeles Lakers uniform? Will it be his last as a professional basketball player? And if he’s not done, where would he play in 2016-17? "I hope he retires, because I don’t want to see — I probably played two years too long. I hate to see Patrick Ewing, great as he was, struggle — I don’t like seeing great players just out there, you know?" Barkley said. "Michael Jordan playing for the Wizards, that didn’t do anything for me. Kobe’s obviously not going to walk away from $30 million. This should be like a farewell tour, play 20, 25 minutes a night. The Lakers aren’t going to make the playoffs. Could he play some more? Yeah, of course. His best days are behind him. I hear these fools on TV, talking about, ‘Kobe’s going to get healthy.’ Old people don’t get healthy; they die. Old people don’t get healthy. Father Time is undefeated. … You can get in great shape in the summer, because you’re playing against air. Air doesn’t hit back." It’s another thing entirely, Barkley pointed out, when you’re trying to guard Klay Thompson around three screens in five seconds or trying to shake off Russell Westbrook to get an open shot. "Air won’t block your shot," Barkley continued. The young lions of the NBA are ready to drive the old members of the pride to the sidelines. If Bryant sees that’s the case this season, that could very well play a big part in his decision.